BIG engine … BIG wings … BIG fun! Tiger Moth World understand that sometimes is so much more fun to do things together. So we have put together a special price for two. You will both get geared up in authentic flying suits, leather jackets, goggles and helmets. Your pilot will give you both the full run down on all the excitement about to happen. Next step is to decide who dares to go first. You will both enjoy the experience of your own private flight as well as enjoy the thrill of seeing your partner or friend’s adventure flight from take off to landing. 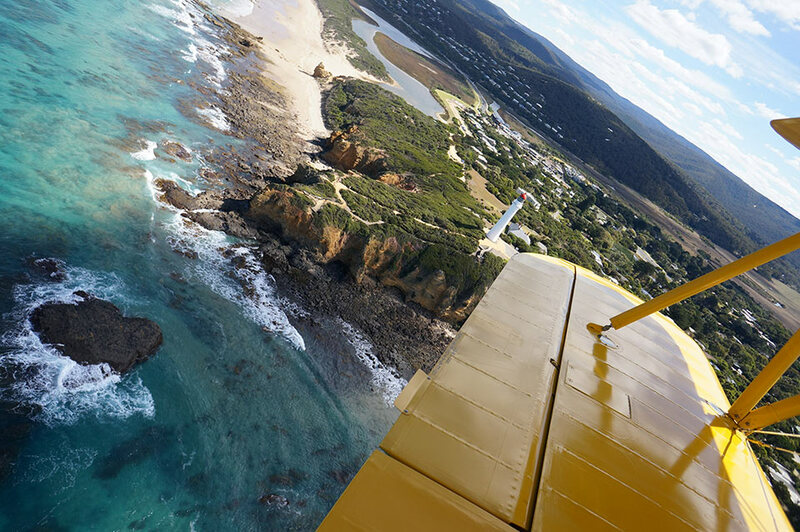 Whichever adventure flight you choose, from lift off to touchdown, you and your friend will each enjoy an awesome flight as you wing your way along the beach and cliff tops of the world famous Great Ocean Road – one of the most spectacular coasts in the world! Tiger Moth World’s own private airfield in Torquay is an easy drive from Melbourne. 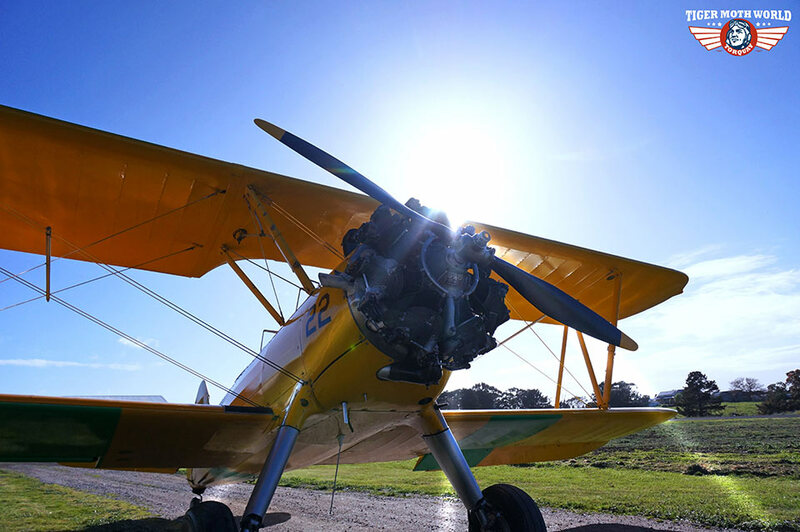 A Tiger Moth World adventure flight is a “must do” when you next visit our beautiful region. Please note: Flight time is engine start to engine shutdown. Times shown are approximate and may vary according to wind conditions and passenger comfort. Experience the thrill of flying in a WWII open cockpit biplane. 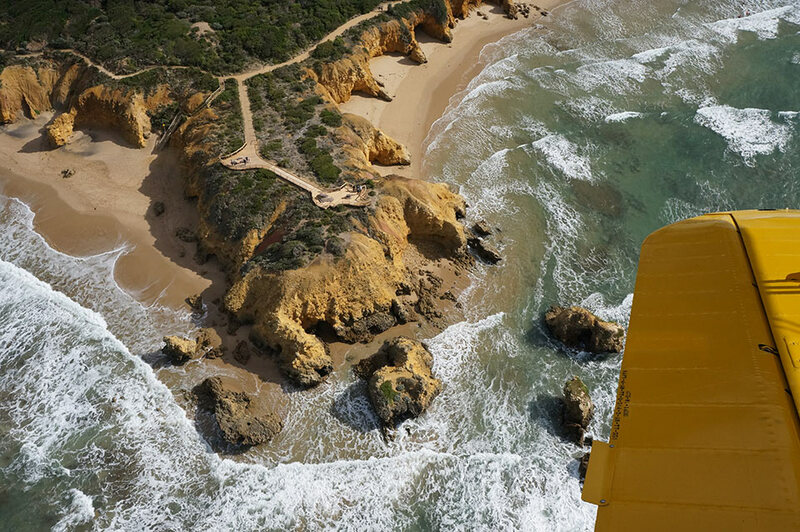 From lift-off to touch-down you will wing your way along the beaches and cliff tops of Torquay, Bells Beach & beyond. Awesome! 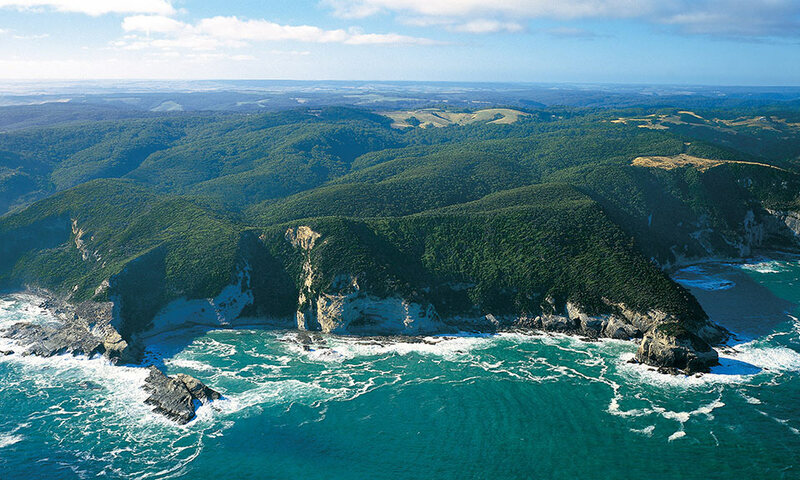 Continue your adventure flight along the coast at low level as you cruise past the Iron Bark Basin and the rugged steep cliffs of Pt Addis and Angelsea. 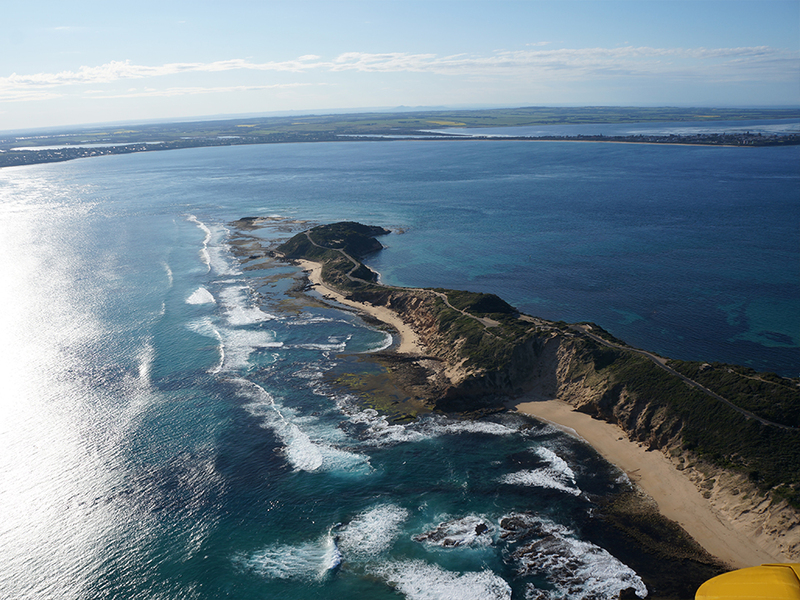 Or wing your way east along the rolling sand dunes past Barwon Heads, Ocean Grove and Pt Lonsdale Lighthouse. One of our most popular adventure flights. 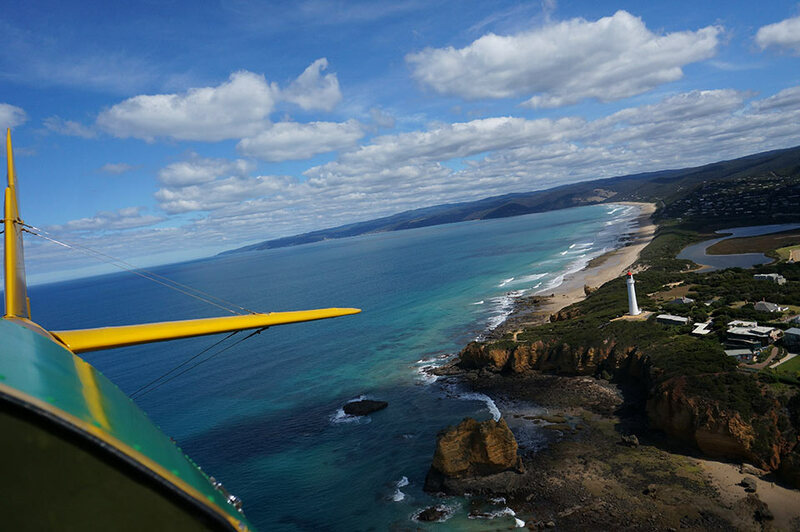 You and your vintage biplane will wing your way along the dramatic coastline of the Great Ocean Road. The Aireys Inlet Lighthouse sitting on the cliff top is quite dramatic! Or cruise east along the rolling sand dunes past Pt Lonsdale and Queenscliff lighthouses before your warbird heads back to Torquay. The rugged coastline and cliff tops of Bells Beach, Pt Addis, Anglesea and Aireys Inlet are simply spectacular. 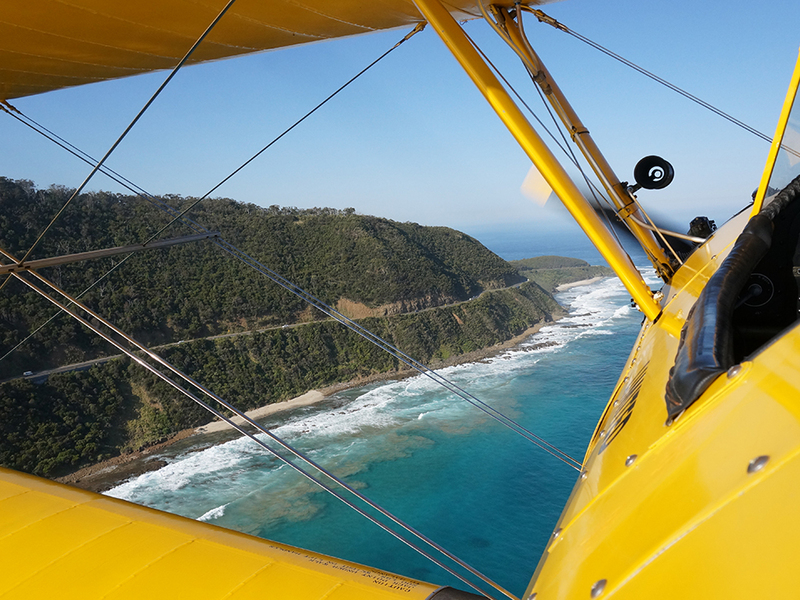 Command your open cockpit biplane onwards and marvel at Cinema Point – one of the Great Ocean Roads highest viewing points. But that’s for the mere mortals on the ground. There is nothing to compare with the birds eye views you have from your WWII biplane. 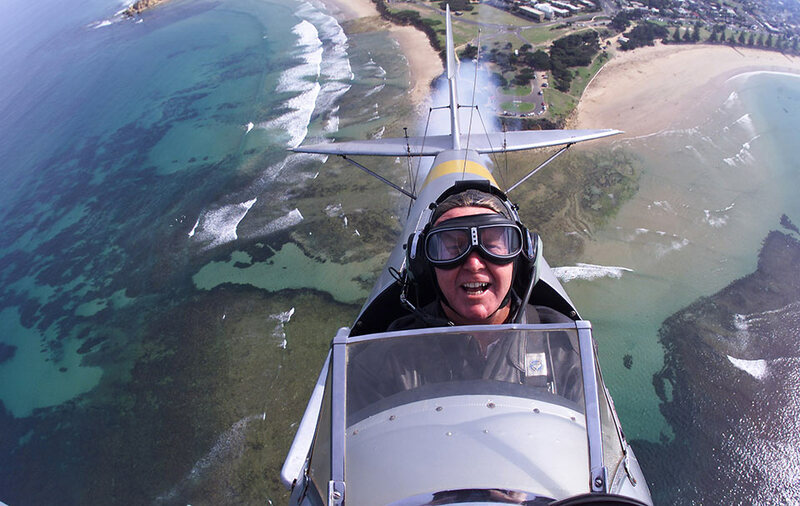 If you prefer, head east on takeoff along the rolling beaches toward the Rip passage and Point Nepean and the old naval gun installations where the first shots of WWI were fired! 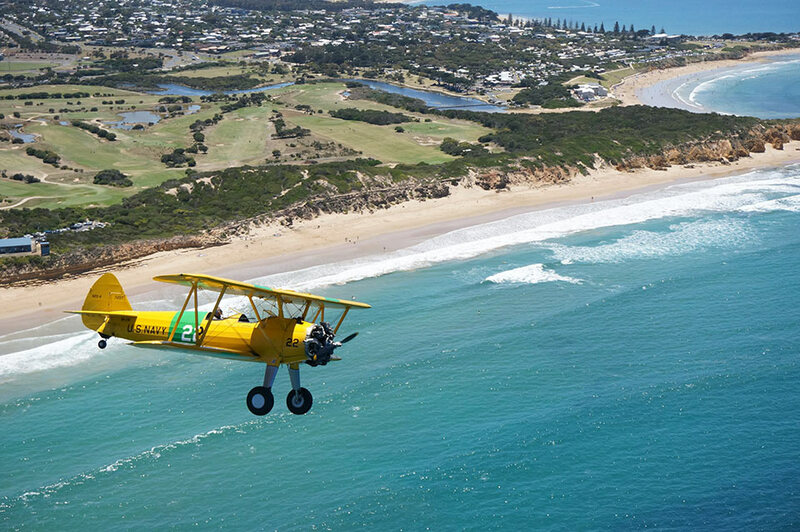 Wing your way along the historic Great Ocean Road in your WWII vintage biplane. The Great Ocean Road was built by returned WWI serviceman. You will be in awe of the spectacular coastline. Sadly your warbird will need to return to base after Lorne to get ready for the next sortie! You may prefer to command your warbird to fly east toward the awesome Rip Passage entrance to Port Phillip Bay. 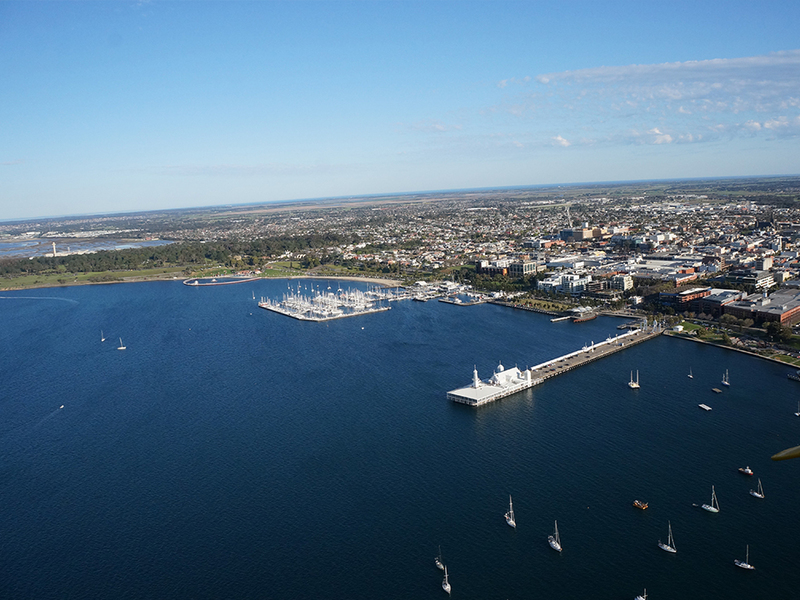 You will continue flying over the historic Pt Nepean military base, before winging your way back home via Sorrento and Portsea. 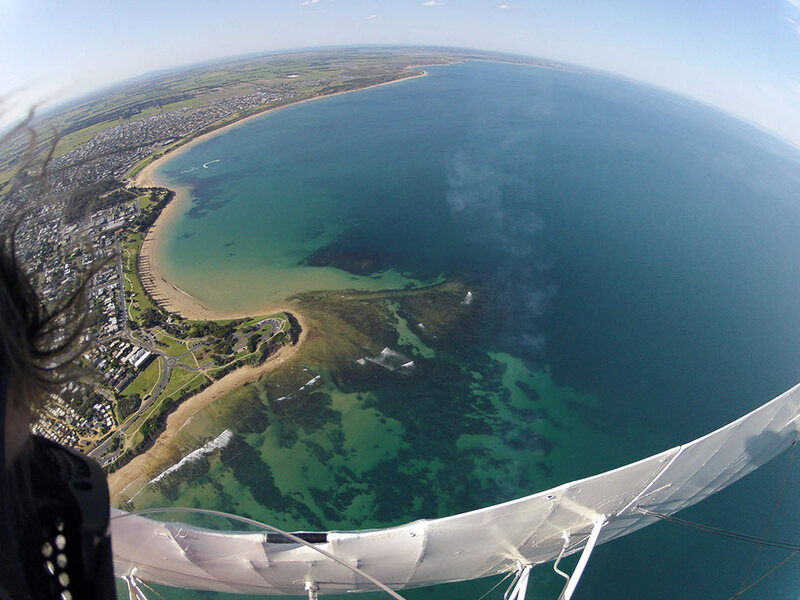 On take off from Torquay Airport, you will enjoy a low level adventure flight as you navigate your way around the beautiful Bellarine Peninsular coastline. Highlights include Pt Lonsdale and Queenscliff lighthouses and views of the awesome Rip passage entrance to Port Phillip Bay, the popular seaside villages of St Leonards, Indented Head and Portarlington. What a way to experience the beautiful Bellarine! If you are a thrill seeker, you will also have the opportunity to upgrade your flights to include mild, wild or adrenalin pumping extreme aerobatics. Feel free to talk to us further about upgrade options or talk to your pilot on the day. We do understand that everybody is different and that you may not both want to do the same thing. Open 10am to 5pm Friday to Monday. Closed Tues/Wed/Thurs.